Google Glass is neat, but it's currently short on third-party apps because Google hasn't opened up the Glassware app ecosystem yet. 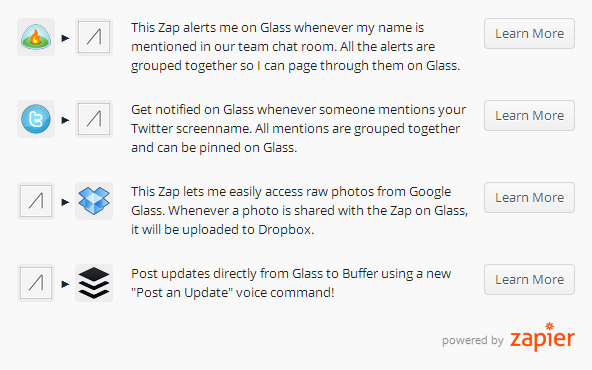 While we wait for that to happen, the data sync service Zapier has added support for Glass that connects it to over 200 online services. Zapier is based around triggers and actions. If you've ever used ITTT, it's a similar idea. Each "Zap" is basically used to make two services interact. So every time X happens on service A, Zappier will execute action Y on service B. The demo in the video shows a method for uploading Glass images directly to Dropbox. That's just an example, though. Zapier ties in with most popular web services like Twitter, Evernote, and Gmail. Setting up Zapier does take a little bit of work, and it's an extra intermediary between Glass and the service you actually want to use. Still, this gives you a lot of power if you don't mind doing some tweaking.